Form Follows Function is her motto. Wearable art is her way of connecting with the natural world. Recently published in a national magazine, she has attained recognition deserving of her amazing talent. 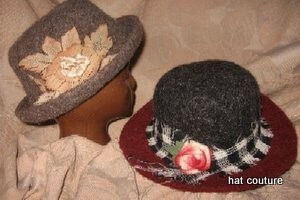 Meet Nancy Louise Olson, multi-media fiber arts and hat couture. Nancy has called the Sierra Nevada Mountain Range her home for 20 years, during which she has enjoyed climbing, skiing the high peaks, wandering the valleys, and running many rivers. Employment opportunities in the Sierra, Alaska and other western states offered her an open canvas; a camera always by her side, she won awards in slide shows. Her natural world, she remembers, was wild inspiration for the artist within. Before the landscapes of the west dominated her lifestyle, she created sculptural pottery while exploring the disciplines of botany and ornithology. Her footsteps have traversed many bridges between the wonders of the natural world and the contributions made by human cultures. One of her earliest fiber art adventures was a class in creating a tule duck decoy. Following, the Museum of the American Indian (Smithsonian) requisitioned her to weave a tule mat for the museum’s ancient artifact exhibit (New York City, Heye Center, “Creation’s Journey” 1994). While commuting via helicopter to job sites in Alaska over 20 years ago, Nancy learned to knit to take her mind off flying. It was her “mind over matter multi-task” that blossomed into functional art pieces with style. She also desperately wanted something else to wear other than ski garb in wintertime which led to her passionate endeavor in creating felted hats. And, since one must have a scarf to wear with a hat, she made room in her life for silk painting and scarves and Hat Couture was in its infancy. 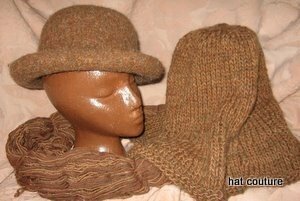 Besides hand knitting and felting wool into hats and other wearables, she also creates chapeaus of silk, straw and cotton. 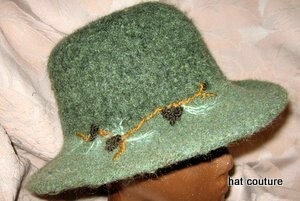 She hand weaves raffia into colorful sun hats. Many of her current explorations include dye painting and surface design on silks, creating handmade paper, and expanding her repertoire in wearable works of handcrafted felts. The use of natural fibers is her specialty and currently she is infusing recycled natural and man made materials into her artwork. Nancy creates and has published her own patterns. Nancy’s work is on display at the North Tahoe Arts ARTisan Shop, and can be reached at (530) 308-0028 or nancylou@ltol.com.